As Israel continues its massive military aggression against the Gaza Strip, which has already cost the lives of more than 2,000 Palestinians, the international condemnation of the atrocities committed by the Tel Aviv regime and its cruel massacre of the unarmed citizens of the besieged Gaza grows steadily. Just recently, a group of Jewish scholars, most of whom were born in the Occupied Territories and teaching at the Israeli universities, have signed a petition, calling on the government of Benjamin Netanyahu to stop its deadly incursion into the coastal territory. A prominent anti-Zionist Israeli historian and intellectual, who is best known for his outspoken criticism of the Israeli government and his opposition to the occupation of Palestinian territories, believes that the Western mainstream media are giving a lopsided and unfair coverage to the war on Gaza, which has many different reasons, including the influence of the Israeli lobby and the fear of these media outlets of being branded anti-Semitist. 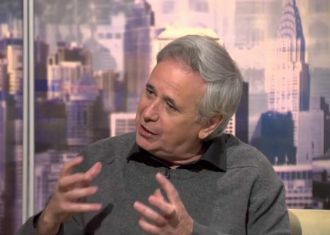 Ilan Pappé is a political activist, historian and professor at the College of Social Sciences and International Studies at the University of Exeter, Britain. He is also the director of the university’s European Centre for Palestine Studies, and co-director of the Exeter Centre for Ethno-Political Studies. From 1984 to 2007, he was a senior lecturer in political science at the University of Haifa. A former member of Israel’s Hadash Party, he was the party’s candidate for the parliament (Knesset) elections in 1996 and 1999. In 2012, he published the book “The Bureaucracy of Evil: The History of the Israeli Occupation” that was released by the Oneworld Publications. Prof. Pappé responded to our questions on the recent Israeli onslaught on the Gaza Strip and the historical, legal aspects of the Israeli-Palestinian conflict. The following is the text of the interview. Q: Can we interpret the Israeli offensive into the Gaza Strip as an effort to ruin the newly-formed unity government in Palestine? Is Israel trying to delegitimize Hamas in the eyes of the people of Gaza Strip who voted unanimously in the 2006 legislative election to bring it to power, and to pretend that Hamas is not capable of providing security and welfare for them? A: Indeed, there is also a more immediate reason for the particular timing of this assault. The Fatah-Hamas unity government and the Palestinian Authority decision to replace the ‘peace process’ with an appeal to international organizations endangers, in the eyes of the Israelis, their control over the West Bank. So the wish was for destroying Hamas politically in the West Bank and militarily in the Gaza Strip. Q: It seems that a growing number of Israeli academicians, intellectuals, journalists and ordinary citizens on the streets are turning frustrated at the policies of Israel and its brutalization of the Palestinian citizens. I just read that a large group of Israeli university professors have signed a petition, calling on Tel Aviv to cease its military operations against the civilian population in Gaza. So, we see an emerging trend in opposition to the Israeli policies. What’s your take on that? A: I would not exaggerate the number of dissenting voices inside Israel. There are of course such voices, but the society at large, 87 percent according to one poll, is not only behind the government’s policy in Gaza, but even demand a more brutal action over there. So I think we cannot rest our hopes for an end to the violence in Palestine on a change from within Israel. Only strong pressure from the outside can produce such a result. Q: Do you think it’s possible to stop Israel from intensifying its assault on the Gaza Strip and violating the international law? Israel has hasn’t paid any attention to the UN bodies’ condemnations and calls for the cessation of hostilities. So, it sounds like international law doesn’t have any mechanism for obligating Israel to abide by its commitments as an occupying power under the international law. What do you make of it? A: The only way of stopping Israel is adopting towards it the same attitude adopted against South Africa at the time of Apartheid. For this to be effective, one would have hoped to see a change in the American position. This is not likely to take place soon. But also in the case of South Africa, the American position was an obstacle for an effective action against South Africa. The fall of the Soviet Union convinced the Americans that South Africa was not needed any more in the cold war. So something similar has to occur to change American positions. But in the meantime it is important to build the solidarity movement with the Palestinians on the basis of human and civil rights’ agenda. Q: All of those Israeli politicians, diplomats, intellectuals and academicians who break the wall of silence and level some criticisms against the discriminatory practices and policies of the Israeli government with regards to the Palestinian people are immediately defamed as anti-Semites and self-hating Jews. Have you ever faced such charges? What’s your perspective on those who want to officially sanction any criticism of Israel under this pretext and obstruct the way to a meaningful dialog on what’s happening in that sensitive region of the world? A: Yes a lot. Self-hating Jew is a common reference to me. But I have no problem with my Jewish identity. My conflict is with Zionism. I think Zionism reduced Judaism into a narrow minded ethno-nationalism that depended on the success of a colonialist project. This brought more misery to Jews around the world, rather than helping them to defeat anti-Semitism. I think now that the Jews are already a third generation in Palestine, they can be recognized as a separate ethnic group provided they are willing to share the land with the indigenous people and not strive to dispossess them. Q: The United States government has offered its unconditional and unrestrained support to the Israeli government in its deadly operations in Gaza, the West Bank and East Jerusalem. Washington is the largest financial and military benefactor to Israel. Israel will never be held accountable if this approach continues. Does it mean that Israel, with its criminal record of murdering the Palestinians would always remain immune to accountability before the international community? A: I think one should not take a deterministic view on this. First of all, the United States was not always pro-Israeli and the American public is not the same as its political elites. In fact, there is a far more significant change in the attitude towards Israel among young American, including many Jews, than in Israel. Secondly, America’s ability to impact world politics has seriously diminished. States such as Brazil, India, Russia, South Africa and China (the BRICS countries) have more influence than ever before. If they are recruited to the campaign to change the reality on the ground in Palestine, then there is a good chance for change and peace. Q: In a September 2006 article, you referred to the Israeli policies in the Gaza Strip as an incremental genocide, and reiterated that its ongoing military assault on the caged people of Gaza represents the continuation of that lethal policy. Do you believe that Israel is carrying out a project of ethnic cleansing and is trying to kill as many Palestinians as possible so as to alter and distort the demographics of the region and realize its plan for establishing the Greater Israel? A: I think it is a bit more nuanced. The Zionist project from its very beginning was having as much of Palestine as possible with as few Palestinians in it possible. The means for achieving it have changed with time. In 1948, the major effort to achieve it was attempted when half of the country’s indigenous people were expelled. More sophisticated means were used afterwards; military rule, discriminatory legislation and small scale ethnic cleansing operations. In Gaza all these means proved useless and therefore the idea was to ghettoize Gaza and hope that this would separate its people from Palestine. But when they resisted the reaction became genocidal. Q: It’s understandable why the Israeli media are giving a lopsided and biased coverage to the war that Netanyahu and his entourage have inflicted on the empty-handed Palestinians. But why do the Western mainstream media, most of the times proudly boasting of their adherence to the codes of ethics and professionalism, follow the same path and don’t talk the truth and present the realities of this unjust carnage that is playing out in the beleaguered Gaza Strip? A: An excellent question. There is no good reason for this biased Western coverage. I think it differs in explanation for different parts of the West. In the United State, there is a strong pro-Zionist, Jewish and Christian presence in the media which reflect both AIPAC and the Christian Zionist Churches’ point of view on Israel. The more liberal press, especially the New York Times, slowly become more critical on Israel but still has not walked the extra mile, maybe because of timidity. In Europe, I think the fear of being accused of anti-Semitism is still very strong, as well as financial consideration connected to pro-Zionist corporations. So they adopted the paradigm of balance and parity which continues to provide Israel with immunity.